In this time of Thanksgiving, we express our gratitude for family, friends, and the gifts from the natural world around us. This respect for the environment is part of many cultures, but Native Americans are especially known for their connection to and appreciation for Mother Earth. Members of the Standing Rock Sioux Tribe have relied greatly on the Missouri River for generations, and now they are fighting for this precious resource, currently at great risk as a result of the proposed Dakota Access Pipeline. Standing Rock Youth and their Rezpect our Water campaign are aiming to raise awareness for this crucial issue through a petition to urge the Army Corps of Engineers to stop construction of the pipeline. A beloved Lakota saying translates to “Water is life.” Although oil companies promise this pipeline wouldn’t put water safety at risk, in 2012-2013 there were 300 oil pipeline breaks in North Dakota. A leak of any size or number could compromise the safety of the Missouri River’s water and life on Standing Rock Reservation, which is located less than a mile away from the proposed pipeline. The Standing Rock Youth recognize that their future and the preservation of their sacred land and water is in jeopardy. As they say, “I can live without money, I can live without oil, but I can’t live without water.” Help Standing Rock Youth by signing their Change.org petition to raise awareness about this vital issue. In this time of Thanksgiving, we express our gratitude for family, friends, and the gifts from the natural world around us. This respect for the environment is part of many cultures, but Native Americans are especially known for their connection to and appreciation for Mother Earth. Members of the Standing Rock Sioux Tribe have relied greatly on the Missouri River for generations, and now they are fighting for this precious resource, currently at great risk as a result of the proposed Dakota Access Pipeline. 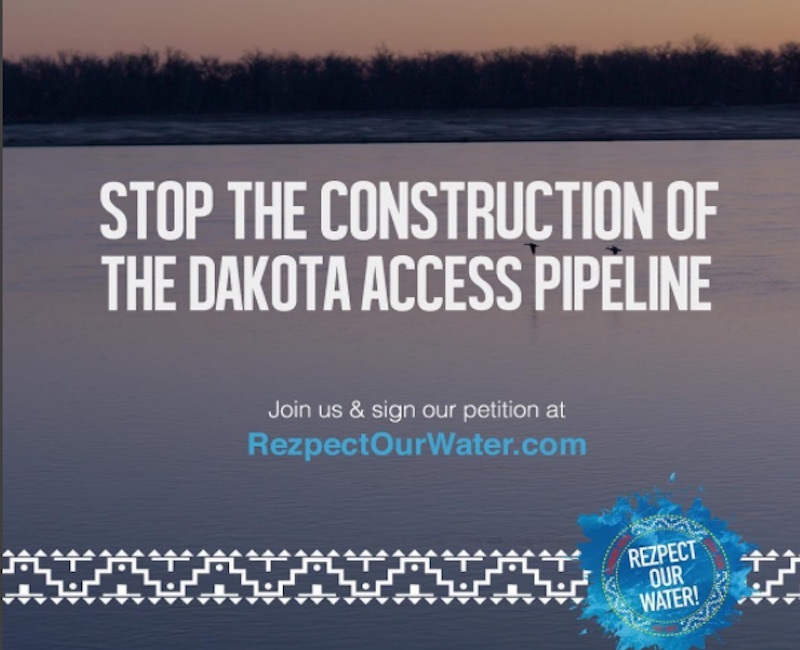 Standing Rock Youth and their Rezpect our Water campaign�are aiming to raise awareness for this crucial issue through a petition to urge the Army Corps of Engineers to stop construction of the pipeline.